The Palate Cleanser is an ethereal installation created as a site-specific response to the upstairs hallway at historic Como House for the interiors showcase event, Como by Design (October 2018). Conceptualised as a deliberate in-between condition to transition individually decorated interior rooms, the new hallway environment is treated as an immersive experience within which the visitor can clear their senses. The materiality of the insertion is aluminium foil sheet, crimped into a parachute-like sheet. 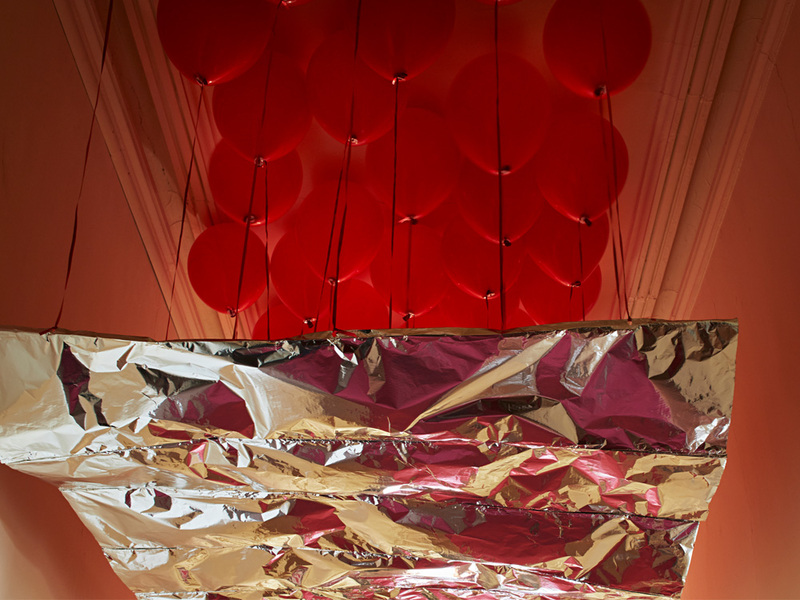 The sheets are suspended within the hallway by 200 helium balloons, leaving all existing surfaces intact and undisturbed. The historic substrate is transformed and refracted in the reflective surface of the aluminium sheet; details of profiled skirtings, the raspberry pink carpet runner and the plaster walls are contrasted to the surrealist metal surface.